In honor of Halloween this week, the awesome scifi pop culture site io9.com asked me to guest blog for them about my favorite crafty Star Wars costume projects made by talented fans. 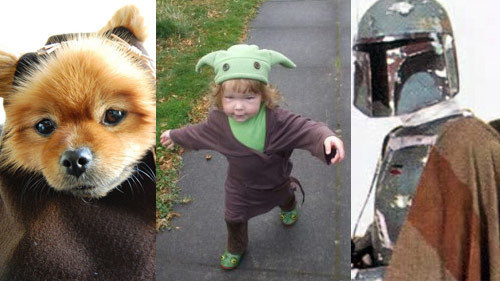 If you're a regular on the Official Star Wars Blog and at Starwars.com, you might recognize a few of the projects like the adorkable Yoda costume for toddlers and the epic dog costumes of an Ewok, Darth Vader and Princess Leia. I also posted Amidala makeup tips and pointers on how to give your Boba Fett costume that special weathered look. There's also links to masks you can print out and wear right now.